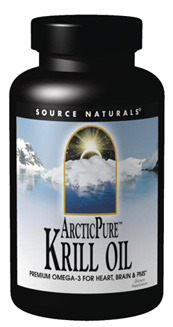 Krill Oil ArcticPure® - 500 mg, 30 softgels (Source Naturals) - Penn Herb Co. Ltd.
ArcticPure® Krill Oil is a premium source of omega-3s and phospholipids, a potent support for heart and brain health, as well as a means of monthly comfort for women. Krill oil additionally contains the natural antioxidants astaxanthin and vitamin A, both of which support protection of cells, eyesight, joint health and immunity. Note: Krill is a tiny shrimp-like crustacean; it's a central component of the ocean's food chain. Research shows humans can also benefit from the crustaceans' many nutrients, notably astaxanthin, a powerful antioxidant coupled with the Omega-3s, EPA and DHA. 2 softgels daily with the first meal for 30 days, then 1 softgel daily thereafter. Contains shellfish (krill), fish and soy. See PDF Label facts for additional cautions.